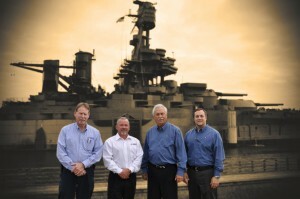 Taylor Norris, CEO Custom Air Products & Services, Inc. (CAPS), announced the recognition of the company for its donations, in the form of HVAC equipment and installations, to a project aboard the historic Battleship Texas. CAPS is a leading commercial and industrial heating, ventilation, and air conditioning (HVAC) company headquartered in Houston, Texas. Houston, TX (PRWeb) November 12, 2015 — Taylor Norris, CEO Custom Air Products & Services, Inc. (CAPS), recently announced the recognition of the company’s donations, in the form of HVAC equipment and installations, to a project aboard the historic Battleship Texas. The acknowledgement took place during a Veteran’s Day meeting aboard the Battleship and involved recognition by the Battleship Texas Foundation’s board members as well as a presentation of commemorative gifts. CAPS team members involved in the presentations included CEO Taylor Norris, President John Boger, Quality Manager Hans Muller, and Project Manager Ben Posson. Launched in May 1912 and commissioned into service in March 1914, the Battleship Texas is notable in so many ways. The Texas is the only remaining WW1 era dreadnought battleship and is also one of only six remaining ships to have served in both World Wars. The list of “firsts” involving the Texas could fill several paragraphs, but one of her most amazing feats is her continuing ability to inform, entertain, impress, and impact people of all ages even today. The Battleship, which today serves as a hands-on museum and visitor attraction, is currently berthed at the historic San Jacinto Battleground in LaPorte, Texas.